Save Significant Money on Dredging Projects! Integrated Lakes Management (ILM) recently completed a mapping project for a Chicago metro homeowners association. The purpose of this project involved sediment monitoring for future dredging. In order to avoid large costs and help property managers budget for sediment removal, ILM located the high priority areas of sediment accumulation and determined the need and location for dredging. The mapping techniques utilized in this project helps ILM accurately calculate in-situ sediment volume and accumulation over time. Thus, ILM is able to accurately isolate areas of high sedimentation for removal and help property managers budget accordingly. This powerful information allows for smart management decisions and will save thousands of dollars in the future. This entry was posted in Lake Map and tagged Bathymetric Map, Chicago Lake, Dredging, Fishing, GPS Lake, GPS Map, Habitat, Illinios Lake, Integrated Lakes Management, lake, Lake Management, Lake Map, Lake Mapping, Lake Survey, map, Pond, Sediment, Sedimentation, Survey, The Mapping Network on December 7, 2010 by Moderator. Integrated Lakes Management (ILM) recently completed a mapping project for a Chicago metro property association. 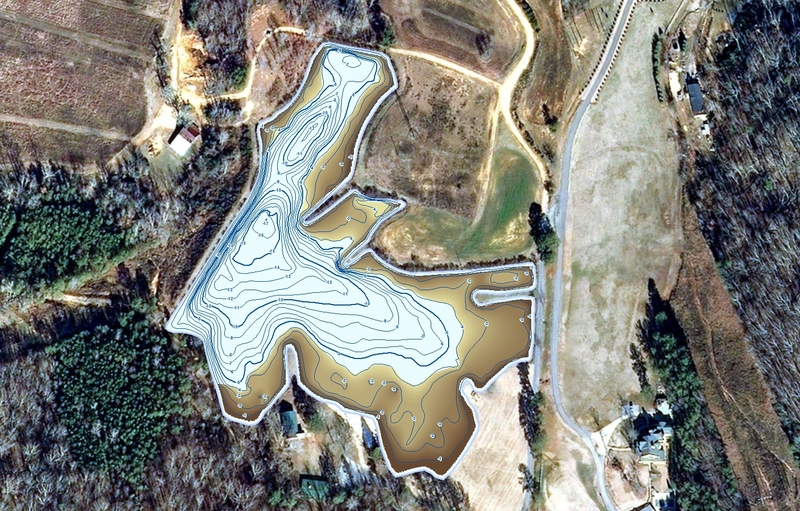 GPS Lake mapping was conducted on site to reveal the actual depths of the water and sedimentation. The primary purpose of this project involved sediment monitoring for future dredging. In order to avoid large costs and help property managers budget for sediment removal, ILM located the high priority areas of sediment accumulation and determined the need and location for dredging. The mapping techniques utilized in this project helps ILM accurately calculate in-situ sediment volume and accumulation over time. 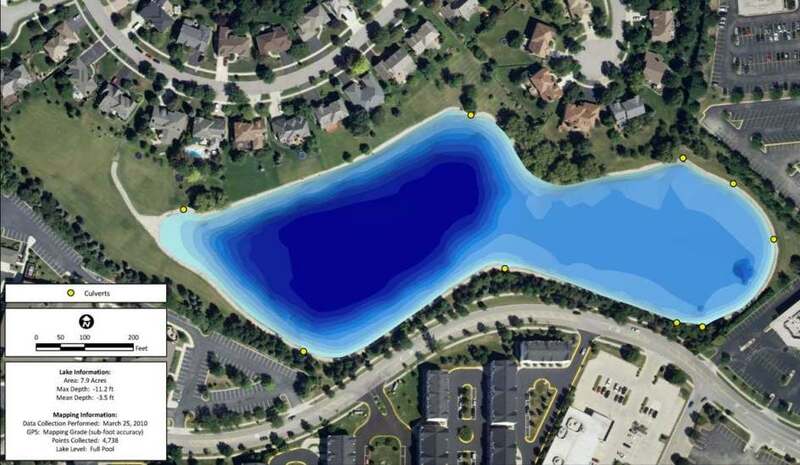 This lake mapping results provided the baseline depth profile needed for ILM to accurately isolate areas of high sedimentation for removal and help property managers budget accordingly. This powerful information allows for smart management decisions and will save thousands of dollars in the future. The maps below show how the resulting GPS Lake Mapping Survey helped visualize where the high areas of sedimentation are located. Please note the maps are compressed and the quality is significantly reduced. For high resolution examples please contact ILM or The Mapping Network. This entry was posted in Lake Map and tagged Bathymetric Map, Chicago Dredge, Chicago Dredging, Chicago GIS, Chicago GPS, Chicago GPS Lake Map, Chicago Lake, Chicago Lake Map, Chicago Sediment Map, Dredging, Fishing, GIS, GPS, GPS Lake, GPS Map, Habitat, Illinios Lake, Illinios Lake Map, Illinois GIS Map, Illinois GPS Lake, Intergrated Lakes Management, lake, Lake Management, Lake Map, Lake Mapping, Lake Survey, Sediment, Sedimentation, Survey, The Mapping Network on April 21, 2010 by Moderator. This entry was posted in Lake Map and tagged Bathymetric Map, Chicago Lake, Dredging, Fishing, GPS Lake, GPS Map, Habitat, Illinios Lake, Integrated Lakes Management, lake, Lake Management, Lake Map, Lake Mapping, Lake Survey, map, Pond, Sediment, Sedimentation, Survey, The Mapping Network on February 17, 2010 by Moderator.